I really didn't enjoy this book, and the only reason I bothered finishing it is because it was such a fast read and I was mildly curious about how they got to the HEA. 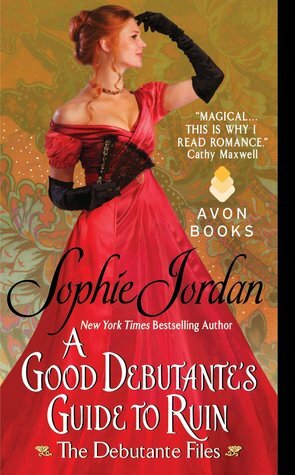 This is the fourth Sophie Jordan historical romance I've been underwhelmed by, and I think it's time for me to admit that her books just aren't for me. What irritated me most about this book is that I didn't really feel like Declan and Rosalie ever fell in love with each other. They knew each other as kids, but they weren't in love then, and now she shows up on his doorstep and suddenly they're madly in love and have to fight their attraction to each other. I didn't understand why they loved each other and I definitely didn't feel like I saw them fall in love and develop their relationship. And there were so many convenient outside factors that pushed them together, they practically never made the choice to be together. I also felt like the villain of the story was too two-dimensional and didn't seem to have any real motivations for her actions other than to be as awful as possible. I liked the premise and I liked the characters, but was incredibly disappointed in this romance. Sign into Goodreads to see if any of your friends have read A Good Debutante's Guide to Ruin.